A couple weeks ago, I popped into a random Shoppers Drug Mart on a whim since I was a little early for a brow threading appointment. They were reducing their Essie stock so nail polishes were all marked down to $4.99 (!!!) I took this as a sign and decided to pick up Essie Lapiz of Luxury to fill in a certain gap in my collection. I have a lot of bold, bright blues and deep navy shades, but there is a noticeable lack of soft, periwinkle blue-type shades. Lapiz of Luxury kind of sits in that "blurple" territory for me. I don't know if my white balance was off or if the formulation has changed from past versions, but other swatches out there of this polish look a lot more blue. I think the photos below are a bit more colour-accurate and slightly less purply, but it still leans in that direction. Bikini So Teeny is similar but more blue. 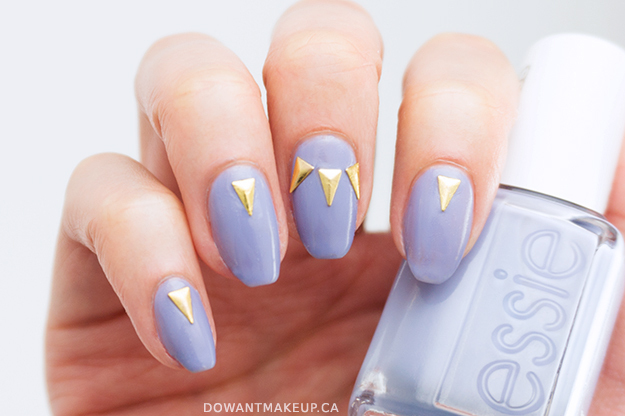 This polish is one of those not-so-beginner-friendly formulas present in some Essie polishes. It's really runny and you need to be careful to have your nails angled slightly downwards as you paint them; the formula is so thin that it will easily flow back and flood your cuticles if your nails are angled upwards. Even with three coats, coverage is a little thin in places and you can see visible nail line if you squint. I recently received some gold triangle studs (also available in silver) from Born Pretty and thought they would pair nicely with the soft, milky Lapiz of Luxury. I have been wanting to use studs on my nails for forever and am so glad I finally got around to trying it. I love that it adds extra embellishment to a look with minimal effort. Each stud is 5 mm long (3/8") and 3 mm (1/4") wide at the base. I think the photographs on the product page show a slightly smaller stud because I couldn't fit 3 onto one nail as easily as shown on the first design. You can see that one of the three studs on my middle finger is not fully adhered to my nail, as the point of the triangle lifts off the surface of my nail slightly. How I applied them: I just barely touched the pointed end of an orange stick into some top coat (toothpick also works!) and used that to pick up a stud. With a fresh layer of top coat applied to the nail (not dried yet), I gently placed the stud on to the nail. You'd think the stud would want to stay with the orange stick, but I have such a small amount on the point that it easily affixes to the nail instead. I gently pushed the stud around at the sides with my stick to straighten it out, while also being careful to not press the stud too hard into the polish so it doesn't sink too deeply. I followed up with a second layer of top coat to make sure the studs last. I also tried it without a second top coat layer and one of the studs popped off about a day and a half later. With top coat, they should hold up for several days unless you are pretty rough on your hands/nails. 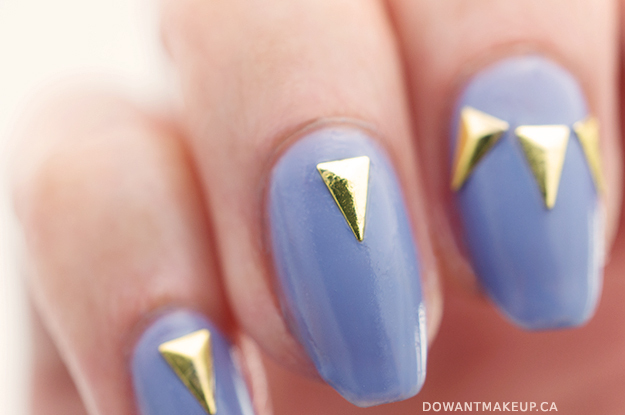 Alternatively, you can apply the studs to a not-yet-dried layer of your base colour and finish with top coat. Stud removal: if there is no top coat sealing the stud to the nail at all, it should be able to pop off if you wedge a toothpick in between and push gently. If there's top coat over the stud, I prefer to weaken the top coat with a non-acetone remover, then pop off the stud and remove the polish as usual with acetone remover. I noticed that if I used acetone remover on the stud, it starts eating at the gold finish and turning the stud slightly coppery-looking. This makes them less attractive to re-use, which is where the non-acetone remover comes in. 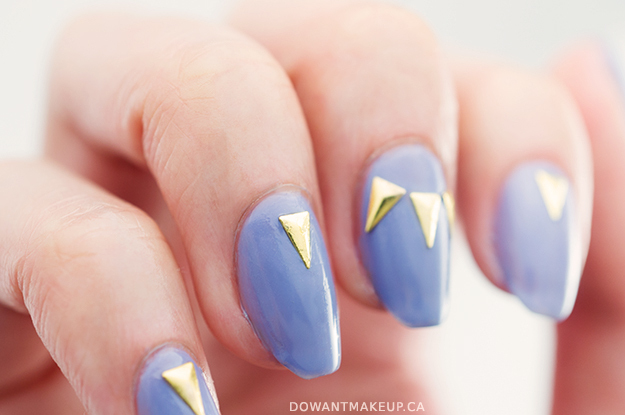 Have you used studs or other nail art pieces to up your nail game? I'm looking for some inspiration!